President Franklin Roosevelt (BIll Murray) and his companion Margaret Suckley (Laura Linney) drive along FDR's Hyde Park estate in Roger Michell's study of a royal visit with international implications and a little-known relationship between the President and a distant cousin. Hyde Park on Hudson is a sequel of sorts to the critical and box-office success of Tom Hooper's film The King's Speech. Both movies feature King George VI (and his wife) and both are based on actual historical events and people. Both movies concern public figures who have to overcome disabilities - crippling polio in the case of President F.D. Roosevelt, a debilitating speech defect in the case of George VI. And the two movies are set in an area of rising international tensions that will result in world war. Speech focuses on the monarch's struggles to overcome his stutter which limits his self-confidence and his effectiveness as the public representative of a crucial British institution as World War II approaches. Hyde Park also occurs against a backdrop of troubling events - a couple of months before the outbreak of that war. The events shown in Michell's movie fall within the period when George VI was being treated by the speech therapist Lionel Logue, as shown in The KIng's Speech. Hyde Park on Hudson has a double focus. It is based on two overlapping events. The first is the visit of the royal couple to the USA in 1939 - the first time a reigning British monarch had visited America. The movie focuses on the weekend that the royal couple spent as the President's guests at his private summer estate at Hyde Park, an idyllic site above the Hudson river. Intertwined with this historical strand is a semi-historical, speculative portrayal of the little-known relationship between President Roosevelt and Margaret (Daisy) Suckley (pronounced Sook-ly), a sixth cousin of FDR's, who became archivist of the Roosevelt family papers. This quiet, rather shy and naive, unprepossessing woman was a favourite companion of FDR, who liked to surround himself with adoring females. The movie claims, without any evidence, that this particular weekend was a critical moment in Suckley's perception of the 'affair'. President Roosevelt drives the royal couple in his custom-built car during their visit to Hyde Park. 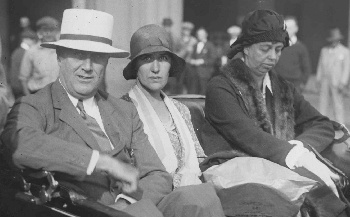 The woman seated in back is not FDR's wife but his daughter-in-law, Daisy. How significant was it that Eleanor Roosevelt did not accompany the King and Queen? Just how accurate is Hyde Park on Hudson? According to the movie, President Roosevelt and his distant cousin Margaret (Daisy) Suckely had a relationship during the late 1930s. The movie uses the weekend to examine the exact nature of that friendship within the context of the president's intricate relationships with other women in his life, including his mother, wife, and secretary. • Margaret Suckely was indeed a distant cousin of the President. • She was at Hyde Park during the weekend of the royal visit. • FDR frequently took her out for drives along his Hyde Park estate. • The pair did have an ongoing relationship, but it was almost certainly one of emotional companionship rather than physical intimacy. • Margaret undoubtedly regarded FDR with considerable affection. Proof of this can be found in her diary and letters. When Suckley died aged 99 in 1991, friends found a suitcase crammed with her diaries, and letters from FDR. The latter covered the years from 1933 until his death in 1945. 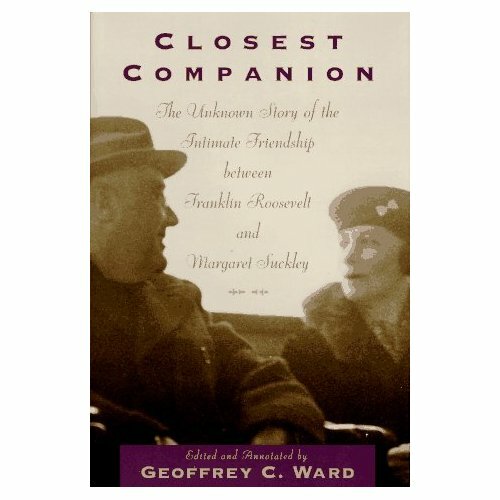 The historian Geoffrey Ward uses this evidence in his book Closest Companion: The Unknown Story of the Intimate Frienship between Franklin Roosevelt and Margaret Suckley. 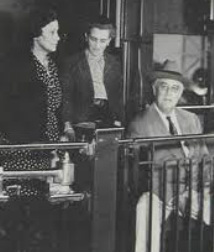 A rare photo of Margaret Suckley (on left) with FDR. Probably taken 1944. FDR and Margaret on the cover of Geoffrey Ward's book about the couple. In her diary, Margaret described herself a "prim spinster".Her family, once wealthy, had been ruined by the depression.Short of money, lacking coventional good looks, and rather dowdily dressed, this intelligent and likeable woman provided companionship and affection for FDR. As Ward, reveals, in 1935 the president wrote to her declaring "I miss you very much". He also wrote "I have longed to have you with me". Months before his death, Roosevelt wrote " I wish so you were here". After he died Sockley claimed in her diary that "He told me once that there was no one else with whom he could be so completely himself". • FDR obviously trusted Margaret and seems to have enjoyed his conversations with her as a way of relaxing from the pressures of the job. 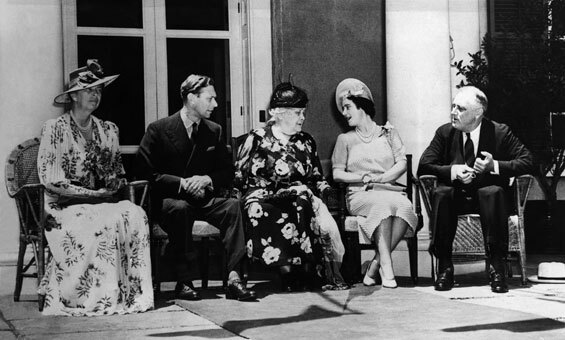 During the war he not only told her about the upcoming D Day invasion, but expressed his frank opinion about about people like Churchill - "a tremendously vital person" - and described Charles de Gaulle as "a headache"
Hyde Park on Hudson shows the King and Queen, FDR and his wife Eleanor, the President's mother, Margaret Sockley and FDR's secretary Missy Le Hand as being involved in the events of the weekend. • All these people were present at Hyde Park over the weekend, although their conversations are the work of the scriptwriter and not based on any historical record. • There was extensive photographic documentation of key official events of the visit, some of which have obviously been replicated in the movie. • The President and the King held in formal but important conversations about the international situation in the evening. Historians agree that there considerable rapporte developed between the two. At church on Sunday. 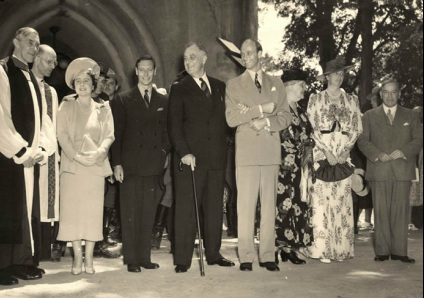 From left, Queen Elizabeth, King George VI, FDR, son Elliot Roosevelt, FDR's mother Sara Roosevelt, Eleanor Roosevelt. First Lady with King George VI, President's mother, Queen Elizabeth with FDR - according to the movie. The movie includes a scene involving tensions and misunderstandings over a picnic meal featuring hot dogs. It also has a scene in which FDR and George VI go swimming together. • The hot dog incident really occurred. • As shown in the movie, either Eleanor Roosevelt or the President decided to include hot dogs on a picnic held for the royals. His socially uptight mother mother was indeed shocked by serving this working-class gastronomic delight up to royalty, and remonstrated with her son. 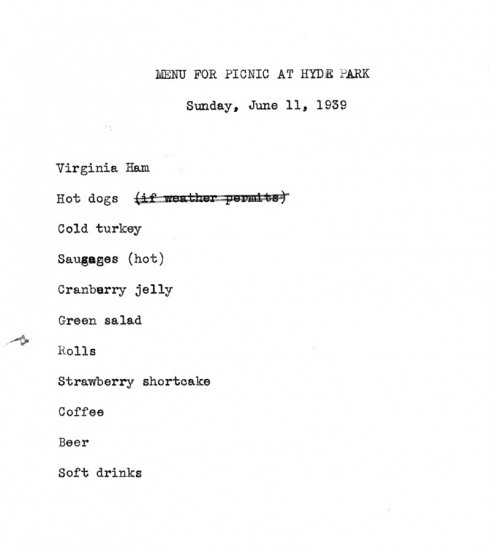 To make matters worse, the King was initially reluctant to consume the hot dog, apparently believing that it was canine in origin - FDR had to explain the provence of the delicacy to him. FDR, Missy LeHand and Eleanor Roosevelt. • Roosevelt's complex relationships with the many women in his life would require a very long mini-series. Two constants in his fascinating life seems to have been his enjoyment of being the center of feminine attention and a delight in manipulating the consequences of these relationships. In other words, politicvs at the personal, intimate level. • The president, even after polio left him a paraplegic below the waist, had several emotional - romantic attachments with various women, including an 'affair' with Lucy Rutherford which led to an estrangement from Eleanor. • Roosevelt's marriage with Eleanor was undoubtedly fraught after revelations of his relationship with Mercer was revealed, but the extent to which the marriage remained embittered remains unknown. The pair appear to have worked out an arrangement by which they maintained a public facade of harmony and compromise. • The movie is correct in its portrayal of his mother's overbearing manner towards him and the uneasy relationship between Eleanor and Sara. 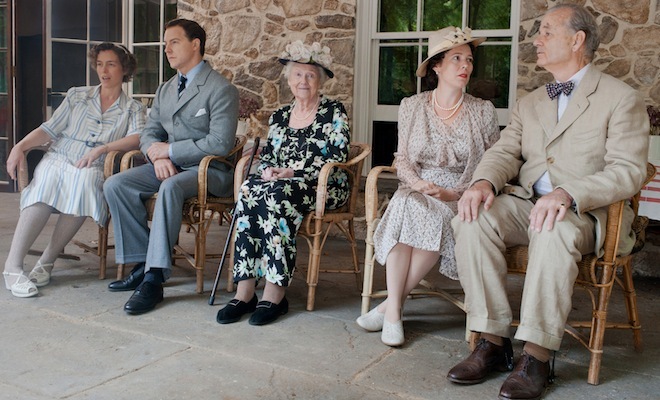 • Michell's film portrays a physical relationship between Suckley and FDR, but there is no proof of this. • The movie suggests that Marguerite (Missy) LeHand and Margaret Suckley were romantic rivals for his affections. Again, this remains conjecture. Eleanor and FDR at Hyde Park: the exact nature of their marriage will always remain uncertain. Hyde Park on Hudson suggests that King George VI used Roosevelt's invitation to visit the USA officially - and Hyde Park informally - as an opportunity to argue case for American support in the ongoing European crisis provoked by Hitler's aggressive territorial demands. • The presidential invitation was made in 1938, the year of the Munich crisis and British Prime Minister Neville Chamberlain's appeasing the dictator by handing over the Sudetenland to Germany at the Munich Conference. It is uncertain to what extent Chamberlain's government sought a closer relationshipo with the isolationist USA as Hitler's intentions became obvious even to the Prime Minister and his supporters. • The idea for the royal visit originated not with George VI (as a constitutional monarch, his diplomatic actions were decided by his government) but with Roosevelt. The historian David Reynolds has shown that both the official aspects of the visit and the informal stay at Hyde Park demonstrated FDR's masterly political skills. He invested a ceremonial event with subtle but important diplomatic significance. For Reynolds, it demonstrated that Anglo-American relations were on a friendly footing. FDR also sought to present the royal family in a more democratic, friendly setting, thus more pleasing to American eyes. See David Reynold, World War to Cold War, Oxford, pp.145-147. • The movie fails to make sufficiently clear that during 1938-9 FDR was unhappy with the strict isolationist foreign policy imposed by Congress and wanted to move American public opinion onto the side of Britain in the struggle with the Nazis. He shrewdly realised that the glamour and novelty of a royal visit to America would bolster public sympathy and thus enhance his chances to undermine isolationism.In this way the President was able to circumvent some of the isolationist political influence of important groups like Irish-Americans and German-Americans. 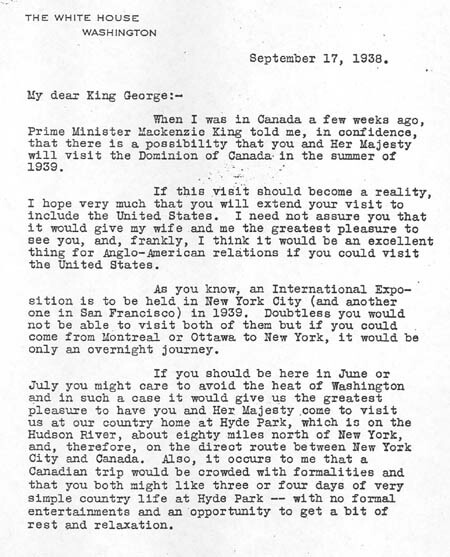 • By inviting the Canadian Prime Minister Mackenzie King to Hyde park as well FDR was ensuring a good relationship with American's northern neighbour. • The movie is correct in showing that FDR and the King held informal late-night discussions on Anglo-American relations and the international situation. George VI - earnest and naive, according to Reynolds - got on well with Roosevelt. • The King's notes on the meetings provide revealing insights into the extent of the President's support for Britain. I had two good conversations with the President, besides many opportunities of informal talks on current matters in the car driving with him. He was very frank and friendly, & seemed genuinely glad that I had been able to pay him this visit. He gave me all the information in these notes either in answer to my questions, or he volunteered it. ....I was alone with him for the 2nd conversation. We discussed Europe in a general way. He hoped France & Italy would try & get together. He was doing his best to get New York to loan money to Roumania. I told him how difficult it was for us to help the Balkans as there was the Mediterranean to convoy things through, & they would want all they had got in a war. I explained to him Roumania's position as to frontiers having 4 to cope with. Because of the air we were only just becoming frontier-conscious ourselves. In the whole of N. America he has none. He was definitely anti Russian. I told him so were we but if we could not have an understanding with her, Germany probably would make one. He showed me his naval patrols in greater detail about which he is terribly keen. If he saw a U-boat he would sink her at once & wait for the consequences. If London was bombed USA would come in. Offensive air warfare was better than defensive & he hoped we should do the same on Berlin. Trinidad Patrol. Base for his fleet at Trinidad to fuel & replenish stores. From this base he can patrol the Atlantic with ships & aeroplanes on a radius of approximately 1000 miles on a sector of latitude of Haiti to latitude of Brazil. This patrol should locate any enemy fleet, which tried to get to S. Am. or the West Indies. Bermuda Patrol. Base as above. To patrol N. Atlantic from Cape Cod to Florida, with ships & aeroplanes to prevent submarines from attacking convoys. Brazil. Germans have an air base at Natal Cape St. Roques also a landing ground on the island of Fernando Noronha 200 miles from the coast. Brazil is pretty sure to kick out the Germans. He would then use it himself. Haiti, Cuba, & West Indies are potential friendly bases. The idea is that USA should relieve us to these responsibilities, but can it be done without a declaration of war.